Each factory has special skill sets to service the needs of our customers. 27th Street is our multi-style factory producing a wide variety of products (WRAP Certified). Baron is our unique customer uniform operation. Southern is our large volume-high embellishment operation. 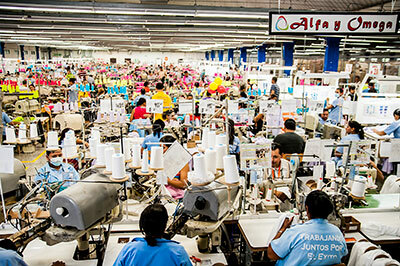 Nicaragua allows us to import fabrics duty free under the TPL Agreement. New Holland Apparel is a star performer in all of these sports . . .
From product development of prototypes to big and small production runs, we do it all. The quick turn is our best move of all . . .
We live for the tight deadlines. And our ability to deliver quality goods quickly has earned us a customer list that's the Who's Who of sportswear - from $2 million to $25 billion companies. Give us a project and see what these companies already know. That New Holland Apparel has the professionalism, experience, competitive pricing and the dedication to quality to deliver products that will not only make you money, but make you proud. Our commitment to you is to strive to not only meet but exceed your expectations. Let our customer-focused team show you how we’ve done it!